I had to admit this asparagus/gruyere ravioli from Whole Foods was pretty good. I served it with a little butter and olive oil, and a dusting of Parmesan, and had salad on the side. It really is amazing what good ravioli one can find now (even Trader Joe’s has some decent ones), and the quality, and thinness of the dough (thinner is better for delicate fillings), has greatly improved. I used to think ravioli fillings were generally lacking in flavor, but most places have paid more attention to that, as the flavors have gotten more creative. So now I’m a ravioli fan, whereas I didn’t used to be. But Lucy’s Ravioli Kitchen, the “original” in our area, is still my favorite, especially knowing they use a lot of local ingredients, and you can watch it being made right in the back of the store. 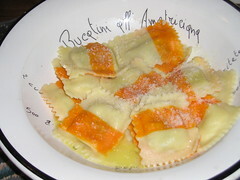 They led the charge for fresh pasta here, and their excellent sauces, and other prepared foods, artisan breads, etc. are peerless. Their rustic tomato sauce, with a touch of anchovy that adds deep flavor, is fantastic. And so is their sage cream sauce, which should come back into season soon, along with the squash and pumpkin ravioli that are the perfect match. Yea for fall weather!